Dutch jurist; son of Moses Salomon Asser; born at Amsterdam, Holland, Feb. 15, 1780; died Aug. 3, 1836. He studied law and philology at the Athenæum at Amsterdam. After obtaining a doctor's degree, July 3. 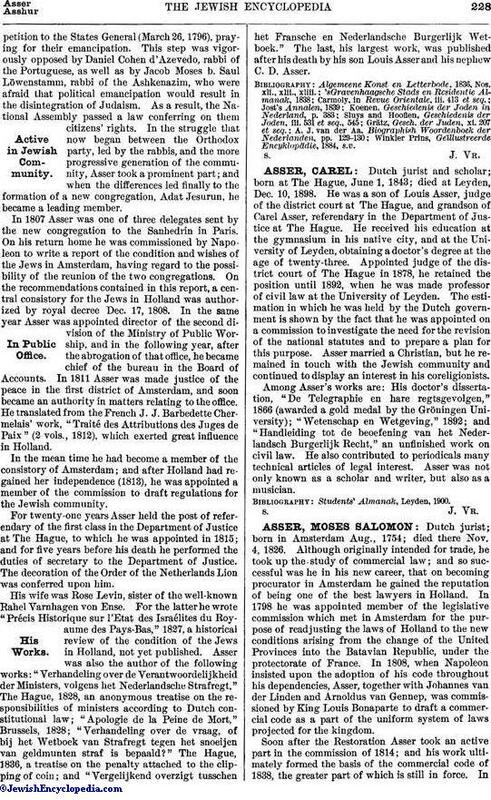 1799, Asser devoted himself to the practise of law in Amsterdam; he and his friend Jonas Daniel Meyer being the first Jews to become lawyers after the establishment of the Batavian republic. The defense of a certain Mascel of Dordrecht, accused of blasphemy for having manifested doubts concerning the divinity of Jesus and the Trinity, brilliantly conducted by Asser and Meyer, drew upon the young men the attention of M. C. F. van Maanen, chief attorney and, later, minister of justice. In spite of his absorbing professional duties, religious matters did not fail to receive Asser's consideration. When he was only sixteen, he and his father shared in the founding of the Felix Libertate, a society which had for its aim the emancipation of the Dutch Jews; and he was among the signers of apetition to the States General (March 26, 1796), praying for their emancipation. This step was vigorously opposed by Daniel Cohen d'Azevedo, rabbi of the Portuguese, as well as by Jacob Moses b. Saul Löwenstamm, rabbi of the Ashkenazim, who were afraid that political emancipation would result in the disintegration of Judaism. As a result, the National Assembly passed a law conferring on them citizens' rights. In the struggle that now began between the Orthodox party, led by the rabbis, and the more progressive generation of the community, Asser took a prominent part; and when the differences led finally to the formation of a new congregation, Adat Jesurun, he became a leading member. In 1807 Asser was one of three delegates sent by the new congregation to the Sanhedrin in Paris. On his return home he was commissioned by Napoleon to write a report of the condition and wishes of the Jews in Amsterdam, having regard to the possibility of the reunion of the two congregations. On the recommendations contained in this report, a central consistory for the Jews in Holland was authorized by royal decree Dec. 17, 1808. In the same year Asser was appointed director of the second division of the Ministry of Public Worship, and in the following year, after the abrogation of that office, he became chief of the bureau in the Board of Accounts. In 1811 Asser was made justice of the peace in the first district of Amsterdam, and soon became an authority in matters relating to the office. He translated from the French J. J. Barbedette Chermelais' work, "Traité des Attributions des Juges de Paix" (2 vols., 1812), which exerted great influence in Holland. In the mean time he had become a member of the consistory of Amsterdam; and after Holland had regained her independence (1813), he was appointed a member of the commission to draft regulations for the Jewish community. For twenty-one years Asser held the post of referendary of the first class in the Department of Justice at The Hague, to which he was appointed in 1815; and for five years before his death he performed the duties of secretary to the Department of Justice. The decoration of the Order of the Netherlands Lion was conferred upon him. His wife was Rose Levin, sister of the well-known Rahel Varnhagen von Ense. For the latter he wrote "Précis Historique sur l'Etat des Israélites du Royaume des Pays-Bas," 1827, a historical review of the condition of the Jews in Holland, not yet published. Asser was also the author of the following works: "Verhandeling over de Verantwoordelijkheid der Ministers, volgens het Nederlandsche Strafregt," The Hague, 1828, an anonymous treatise on the responsibilities of ministers according to Dutch constitutional law; "Apologie de la Peine de Mort," Brussels, 1828; "Verhandeling over de vraag, of bij het Wetboek van Strafregt tegen het snoeijen van geldmunten straf is bepaald?" 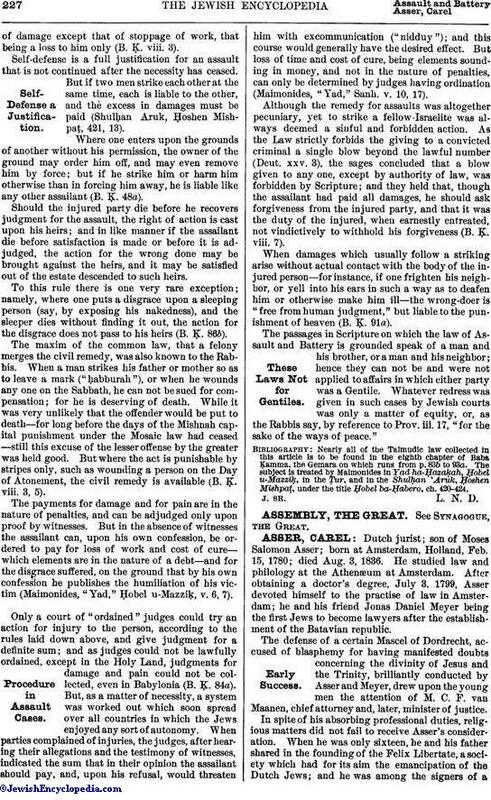 The Hague, 1836, a treatise on the penalty attached to the clipping of coin; and "Vergelijkend overzigt tusschen het Fransche en Nederlandsche Burgerlijk Wetboek." The last, his largest work, was published after his death by his son Louis Asser and his nephew C. D. Asser. Winkler Prins, Geïllustreerde Encyklopädie, 1884, s.v.